An early visual representation of the cosmos. Wall painting from the Jordanian Chalcolithic period (c4700-3700 BCE) settlement site of Teleilat Ghassul. 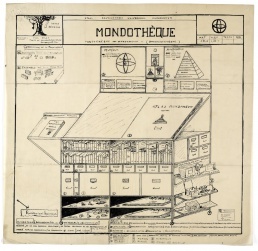 Paul Otlet, Mondothèque: Pantothèque - Mundaneum - (Documentothèque), 8 Jun 1936. Reproduction at Mundaneum center. 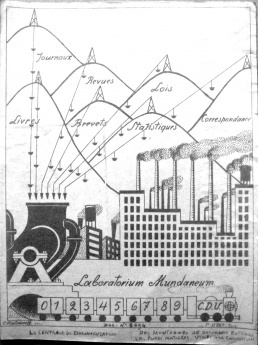 Paul Otlet, Species Mundaneum, 16 Jan 1937. 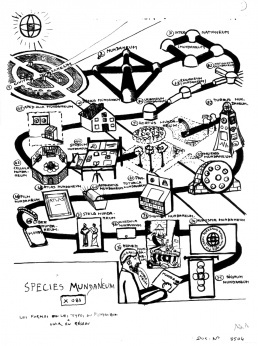 Laboratorium Mundaneum: Powerhouse of Documentation. C. Platounoff on commission of Otlet [28 Dec 1937]. A symposium unfolding from the intention to reflect upon the legacy of Paul Otlet and his work from the perspective of today's knowledge archives. With Dušan Barok (Bergen), Matthew Fuller (London), Geraldine Juárez (Gothenburg), Stéphanie Manfroid (Mons), Marcell Mars (Lüneburg), Nikita Mazurov (Malmö), Tomislav Medak (Zagreb), Michael Murtaugh (Brussels), Robert M Ochshorn (San Francisco), Barbora Šedivá (Brno), Femke Snelting (Brussels), and Matěj Strnad (Prague). For video documentation click here. 5.4 Femke Snelting – Meeting Madame C.
The Mundaneum, an archive and museum devoted to Otlet and Henri La Fontaine and the host of this event, is a milestone in the lineage of documentation science, spanning from the work of Melvil Dewey and Charles Cutter in the United States, through Otlet and La Fontaine in Belgium, to the post-WWII efforts of Suzanne Briet and other documentalists in France and elsewhere. In the 1950s-60s it gave way to the new fields of information retrieval and information science. Besides its lasting discussions about classification systems and the question of what constitutes the document, the part of its legacy which gained strong resonance today is a vision of the universal catalogue of knowledge. Similar figure also laid the foundation, before the turn of the millennium, of a company which has fundamentally changed the ways of how knowledge is produced, accessed and distributed. Ever since its inception, full-text search has been the core service dominating the rest of Google's ever-expanding range of services. Its simplicity and straightforwardness became so habituated that it began transforming research practices as well as digital libraries. Today the full-text search function is featured prominently on the websites of German, Norwegian, Polish and many other national libraries. But despite its omnipresence, its working mechanisms, the actual ways of use and the ways it transforms research are hardly investigated. The present event brings together digital librarians, media theorists, designers, researchers and artists to discuss novel ways of reading and writing research in the digital networked environment. It is to investigate the poetics, aesthetics and politics of information and knowledge in relation to digital libraries, search engines and the legacy of library/documentation science. It is to bring attention to the individual practises of resituating and repurposing knowledge today. Rather than to present papers, each of the ten invited speakers was asked to submit three artifacts to be presented and discussed in several thematic blocks. The 30 collected artifacts take various forms, including concepts, stories, software prototypes, texts, videos, websites, tangible objects, own work, and were selected as to question, defamiliarise, criticise, speculate upon contemporary practices related to the theme. The submissions have been grouped into six thematic sessions which will structure the debate. Each session consists of a block of short presentations/introductions of the artifacts by their selectors (5 minutes each), followed by discussion. Each session will be moderated by one of the guests, so that their drifting between the roles of a moderator, speaker and audience could bring in more play. The symposium is organised in the framework of Dušan Barok's artist residency at Cafe Europa - Mons2015, upon the invitation by Barbora Šedivá, 4AM: Forum for Architecture and Media, Brno. Paul Otlet, a pioneer of information science is today best known as co-initiator of the Universal Decimal Classification system, still used in national libraries of several countries. Other strands of his work began to be investigated on a larger scale only in the 1990s. What is the relevance of his work in light of digital networks? l'ïle du Levant : PP PO 663 III, p.7. extrait du journal intime (Paper Book)- 1883 "Paul sais-tu bien ce que tu devrais faire? Réunir en un petit ouvrage quelques notes sur l'île du Levant et rapporte-les à ton père comme souvenir de ton séjour ici. Si c'est bien fait, nous le ferons imprimer". Imprimer. Ce mot me suffisait!" An image produced and distributed by Google to pay tribute to Paul Otlet in his 147 anniversary in the homepage of their search engine. 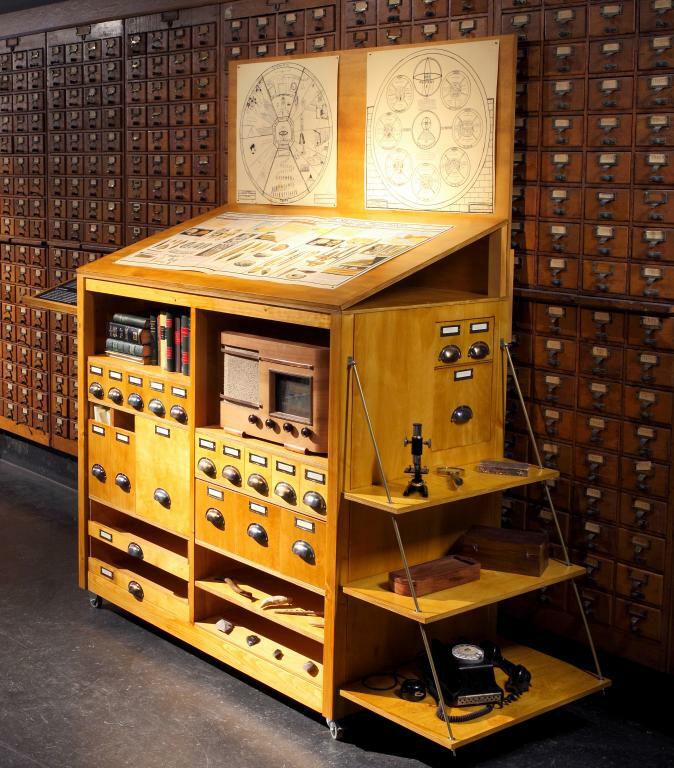 The image and the blog post further integrate/fabricate to their corporate history a relation between Paul Otlet work and the services of Google, using "knowledge" and their Google Cultural institute as narrative thread. On the fly, it is suggestive to draw a straight line from Otlet's statement that "Once one read; today one refers to, checks through, skims", to the practice of full-⁠text search, so successfully branded by the Alphabet companies. But even a superficial browsing of his book, Traité de documentation, shows that such a shortcut can be misleading. Otlet suggests several novel forms of reading, writing (including a pen with integrated eraser!) and dissemination of knowledge, but the book itself is entirely committed to the intellectual work of selecting and indexing documents. By turning The 'book on the book' into a bag of words and submitting it to some crude form of text-⁠mining, I'd like to make a start with finding out what emerges between these two very different approaches of knowledge indexing, rather than insisting on how the one pre-⁠thinks the other. A document describing and representing objects of the world is itself another object. Classifying documents is a process of balancing between fiction and reality, between ideal forms and singular objects. What is the relation between a thing and a document and between a document and a class? This short text is a kind of literary Zeno’s Paradox. It works through problematizing the object-predicate relationship, and handily, shows the power of fiction over reality. With this video i want to mostly ask: Would Google had started their cultural agenda by digitizing Iraqui "treasures" if the US intervention in Iraq had never taken place? This document's complexity (don't even think of printing it, but feel free to use either English or French version or both) perhaps too clearly overshadows any bona fide motivations there might lay behind it. Its structure and long history (cf. version of 1977 with only 13 pages – but with 437 kB in size + notice the instability of filenaming at unesco.org) offers a possibility to compare and track the evolution of systemization and classification of what might be the most unsystemizable and unclassifiable. Further and perhaps the main link to Otlet is of course universality (and the obvious UN etc.). Note: personally I am quite familiar with how the concept of "authenticity" evolved with UNESCO, also through the documents included in the Guidelines (Nara), but the actual inner workings of the WHC are just a bit too much for me. Answers to multiple choice questions in a booklet are answered by placing tiles (numbered in accordance to the question) in a grid whose (where positions correspond to the answer). Once all the tiles are placed, correctness is checked by inverting the tiles and looking colored graphical symbols printed on each tiles reverse side; correct configurations are indicated by graphical patterns that form recurrent patterns. At once a simplistic reduction of pedagogy to multiple choice, the game resonates with aspects of the utopian search for harmonious arrangements of knowledge, while at the same time suggesting a view of knowledge as a kind of diffraction where many combinations exist simultaneously rather than as a singular correct configuration. A collection brings objects into new relationships and configurations, also setting boundaries between them as members and others as the excluded. The work of including and excluding objects in a collection and of designing their relations is a kind of world-making, a telling of a story. What is the nature of this storytelling and how to read between the lines? This art work is part of Haacke’s period of interest in systems, and shows the inter-relation of shell-companies in the ownership of a small number of properties in New York. The process of writing off books from a library collection is permanent negotiation between the library's limited resources and the unending flood of printed matter continuously entering the library. However, not all use of the books is exhausted in reading. In fact most of the books in a library never or rarely ever leave the shelves. Hence, the write-off triage of books that are never lent and that need to go is never simply a question of technical criteria (and, as we know, the technical criteria are least of all merely technical). Libraries' work at classifying and ordering, displaying or suppressing, triaging or writing off is a subtle work of shaping class, culture and national identity, a work of political ordering and classifying. Except that sometimes that work is not so subtle at all, as when Serbian, Cyrillic or Socialist books were exorcised from the Croatian libraries in the 90s in an uncoordinated yet systematic manner. In my main field of work, one way of understanding institutions is by asking about their name and mission – I am confronted with film archives, film museums and cinematheques ("filmbraries"). This probably applies to a wider scope of agenda and our concept of library/museum/archives: is there still a difference and do we want to maintain it? Google Image apparently thinks so. Femke Snelting – Meeting Madame C.
About the consequences of lives intersecting with the universe of the archive. The story includes two appearances of Madame C (almost a century apart), and two inventorized cats. With Meeting Madame C. I'd like to bring to the table/⁠⁠discuss the extensive care networks involved in maintaining knowledge. Essay about the emergence of the Google Cultural Institute and the colonial impulse that sustain the accumulation of cultural artifacts in a planetary scale. Organizing information is never innocent. Interface design models user experience. How collections are grasped, navigated and used is guided by codes and protocols of display. Reading, comparing and searching documents through the screen involves more than a work with the shown text and image. How to see the invisible? Once an invaluable device for every engineer (you may note how the case is designed to be affixed to its operator's belt), the slide rule is maybe best described as an analog calculator. Unlike a modern digital calculator, the slide rule requires the (human) calculator to mentally maintain the correct order of magnitude (or scale of a calculation) meaning that calculated quantities are overtly contingent on the knowledge of the operator rather than presented as seemingly absolute and precise external fact. Open-ended web-based documentation software for the organization of large qty's of video. Variants: Montage Interdit, VideoVortex9, ZKM Screen Dreams. 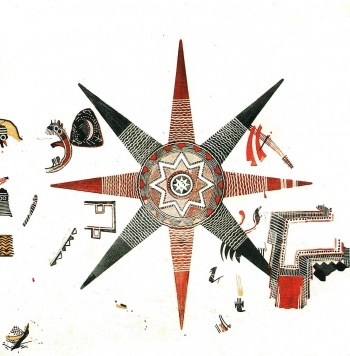 Out of frustration by their incorrect licensing and being unavailable for re-⁠use (Public Domain, no download), one night we decided to scrape all images from the Mundaneum section on the Google Cultural Institute website. We ended up with a perplexing mass of 21.845 image tiles, each 512 by 512 pixels in size. Trying to make sense of this fractured "collection", we grew fascinated by the way these images were algorithmically treated. How does one look at images on the fly? Correct me if I'm wrong (and I'd be happy if I were), but how is it that we still reference <21st century books we don't have in our hands instead of admitting our libraries are pdf-based? And only if and when our primary research (read: internet search) doesn't yield any (searchable, quotable, copy-pastable) results we come back to the physical libraries both public and private. Who will start, or is this already happening? (It might seem to be with the DOI and such, but what we really need is MD5 checksums for citations, keyword: information fixity). An artifact of the telegraphy age; Lieber's Code was sold as a system for commerce of the day to communicate messages economically, the book acts as a translation from a wide array of topic-organized formulaic communications reduced to single word "codes" -- the resulting messages are thus transmitted both more economically (less words to pay for) and discretely due to illegibility of the resulting arbitrary code words. Both properties resonate with aspects of the digital communication in general and with text-mining techniques (such as "bag of words" representations) where economies of computation and indexability are a factor. Documents want to be treated as self-contained entities, with freedom of movement across collections. However, by being always already embedded in multiple domains/regimes that claim to contain them, they operate between autonomy and agency in the world. Their sole presence in a collection intervenes in protocols of wider legal and economic regimes. How and at what costs? I'll talk about heros. Aaron Swartz and Alexandra Elbakyan. Not that they are bandits or couple. Also about Peter Sunde and other TPB guys. I would like to talk how the system generates that discourse and the need for epic and heroic narratives. How in the past, when it comes to knowledge it was mostly about the dangerous ideas which made the martyrs: Bruno, Galileo or Copernicus. These days it is about access and infrastructures. An object of exchange unsettling the economy of cultural production, nowadays the makings of a production model that serves the market power much more than the labor of cultural producers, an object begging a question what do we do at a rare juncture when a historic opportunity presents itself to reconsider how a good such as knowledge and culture gets produced and distributed in a society. Advanced eBook Processor, a tool for removing content protection from PDF files, led to the arrest of one of its Russian developers, Dmitry Sklyarov, when he came to the US to deliver a conference presentation on ebook security. An anti-copyleft button, found on a cultural battlefield. Does it signal an avowal of support for copyright; or, does it perhaps connote a refusal of acquiescence to ostensibly palatable modes of valorized oppression, thus signaling the need for a wholesale rejection of Intellectual Property? The power of abstraction is to shape reality. Structures and configurations presented in documents and collections act upon their readers and users. It's a kind of magic. This short manual for the use of the index card system as it was first being introduced is a model of rhetoric in favour of efficiency, and of the early use of the term “system” in business literature. It provides a means of understanding how a particular media technology implicates and develops a form of informational abstraction similar to a relational database, and a form of labour around information. Explorations of using physical books and cards to navigate a digital archive. Variants: Skid Row History Museum, Americanah cards, Video Binder. A CIA operative, Walter Burke, once said "I could've saved her, but the information was more important. The information was more important than she was. More important than I was. It's what we do" (The Recruit, 2003). Does it make sense to conceptualize of the archive in relation to the human (be it anti-human or post-human), or is the archive a move towards, simply, nonhumanism? A tool for friends to help each other by sharing their access to the router with an IP address sitting in the "right" country. A structure of storage, ordering and displaying that provides material affordance both to the comprehension of totality and the serendipity of discovery has been rendered obsolete. The digital collections have moved scales of how text is parsed and understood from book to collection, from flipping pages to querying databases. And yet the shelf has staged a return in the shape of an awkward symbolic representation of the library collection in the interfaces of numerous applications, arguably expressing a persisting interrelation between the order and ingenuity, structure and contingency in the affairs of science and letters. Dušan Barok is a writer, editor and artist. His work combines the aspects of artistic practice, design research, humanities scholarship and software development. He is best known as founding editor of Monoskop, a platform for collaborative studies of the arts, media and humanities. Over the past year he has participated in a number of events addressing the changing condition of research after the large-scale digitisation of scholarly works and cultural heritage. Recently, he convened a symposium on media aesthetics in Bergen, Norway, entitled "The Extensions of Many." Barbora Šedivá graduated in culture studies from the Faculty of Philosophy of Comenius University in Bratislava (MA), and in Public Art and Cultural Management from the Faculty of Fine Arts, University of Technology in Brno (PhD). Barbora is a member of Atrakt Art and 4AM Forum for Architecture and Media collectives. She is also an editor of 3/4 magazine (since 2004), the coordinator of Oskar Cepan Award and Multiplace new media culture festival held internationally. Barbora leads TIM_LAB workshop (Theory of Interactive Media department, Masaryk University) focused on history of media art in Brno. Matthew Fuller is the author of the forthcoming How to Sleep, in Art, Biology and Culture (Bloomsbury). Other titles include Media Ecologies: Materialist Energies in Art and Technoculture (MIT), Behind the Blip: Essays on the Culture of Software and Elephant & Castle (both Autonomedia). With Usman Haque, he is co-author of Urban Versioning System v1.0 (ALNY) and with Andrew Goffey, of Evil Media (MIT). Editor of Software Studies, a Lexicon (MIT) and co-editor of the journal Computational Culture. He is involved in a number of projects in art, media and software. He is Professor of Cultural Studies and Director of the Centre for Cultural Studies, Goldsmiths, University of London. Geraldine Juárez is an artist overwhelmed by the endless tension between information and property, so she works with media, contexts and histories to understand the conditions that define the way in which resources that depend on them are distributed in the present. Stéphanie Manfroid is an historian and archivist at the Mundaneum (1996), where she is responsible for the archives. She completed an inventory of the Mundaneum archives in relation to feminism, through which the Mundaneum was discovered via the figure of Leonie La Fontaine. She has been the head archivist at the Mundaneum since April 2002, and has organized a training program for archive classification which addresses the issue of preservation in the context of new technologies. She has been instrumental in placing the archives of the Mundaneum online using the Pallas software. Presently, her work is focused on the re-examination of the personal papers of Paul Otlet. Among her publications are Henri La Fontaine, Tracé(s) d’une vie [Henri La Fontaine, Traces of a Life] (Mons-Mundaneum, 2002); Colloque Archives Sonores [Conference on Audio Archives] (Mons, 2005); Les archives de la connaissance [The Archives of Knowledge] (Les impressions nouvelles, 2008). Marcell Mars is a free software advocate, cultural explorer, and social instigator. He studied Psychology at the University of Zagreb and finished an education as psychologist and psychotherapist. He is one of the founders of Multimedial Institute - mi2 and net.culture club Mama in Zagreb. He regularly runs workshops on programming, hacking, free software philosophy as well as organising art exhibitions and festivals. Currently he is a PhD student at Digital Cultures Research Lab at Leuphana University, and engaged with the Public Library / Memory of the World, a project to develop sociotechnical infrastructure and invigorate (again) the historical argument for universal access to knowledge. Nikita Mazurov is a researcher interested in investigating modes and strands of resistance to intellectual property; particularly in wholesale rejections of IP, including anti-copyleft movements and unbridled piracy practices (both material and digital), and in further exploring potential modes of ensuring archival longevity and availability of information. Tomislav Medak is a philosopher with interests in contemporary political philosophy, media theory and aesthetics. He is co-ordinating theory program and publishing activities of the Multimedia Institute/MAMA (Zagreb). He is a free software and free culture advocate, the project lead of Croatian Creative Commons team, and the archivist of K_O_K (Catalogue of Liberated Books) digitizing initiative. He’s a supporter of urban activist initiative Right to the City. He is author and performer with the Zagreb based theatre collective BADco. Michael Murtaugh designs and researches community databases, interactive documentary, and tools for new forms of reading and writing online. He teaches on the Masters Degree programme in Design and Communication at the Piet Zwart Institute in Rotterdam, and is a member of the Brussels-based collective Constant. Robert M Ochshorn is an artist and researcher working at the Communications Design Group in San Francisco, where he is developing media interfaces for extending human perceptive and expressive capabilities. Ochshorn holds a BA in Computer Science from Cornell University (Ithaca, NY), and after graduation worked as a Research Assistant in the Interrogative Design Group at MIT and Harvard. In 2012, he was a researcher at the Jan van Eyck Academie (Maastricht), where he developed the open-source InterLace software that was used in collaboration to create the web-based documentary Montage Interdit (presented at the Berlin Documentary Forum 2, June 2012), and he has recently completed a residency at Akademie Schloss Solitude (Stuttgart). He has performed, lectured, and exhibited internationally. Femke Snelting is an artist/⁠designer developing projects at the intersection of design, feminism and Free Software. She is a core member of Constant, an association for arts and media active in Brussels since 1997. The collective work of Constant is inspired by the way that technological infrastructures, data-⁠exchange and software determine daily life. Constant generates amongst others performative publishing, curatorial processes, poetic software, experimental research and educational experiments. Since 2013 she is involved in Mondothèque, a collaborative project that grew out of the shared concern with the mesh of institutional narratives, local politics and corporate interests that coagulate around the heritage of Paul Otlet. Femke co-⁠initiated the design/⁠research team Open Source Publishing (OSP) and coordinated the Libre Graphics Research Unit. She teaches at The Piet Zwart Institute (Media Design and Communication, Rotterdam), a.pass and erg (Brussels). Matěj Strnad is managing the archive at the Center for Audiovisual Studies at FAMU, Prague, and is responsible for digitization projects at the National Film Archive in Prague. His work involves film, video and media art, researching, writing, lecturing and hosting panels on related topics. Mondothèque: A Radiated Book / Un livre irradiant / Een irradiërend boek, 2016. This page was last modified on 20 June 2018, at 16:48. This page has been accessed 18,053 times.